With another week of action behind us, and some more fresh stats to analyze, I’m here to help you with your toughest fantasy football start/sit decisions for Week 6 of the NFL season. Winston was a lot better last year than you may remember. 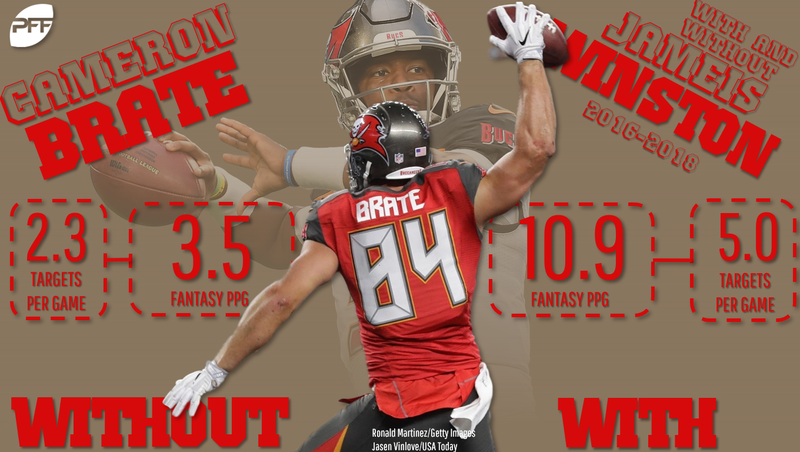 Across the 11 games he played on at least 50% of Tampa Bay’s snaps, he averaged 19.9 fantasy points per game and 306.9 passing yards per game. Those numbers ranked fourth and first, respectively, among all quarterbacks to play in as many games. Winston was also tremendous this preseason, ranking as our highest-graded quarterback. Across the first three games he missed in the regular season, his backup, Ryan Fitzpatrick totaled 101.4 fantasy points, or the fourth-most by any quarterback through any three-week stretch … ever. And now Winston gets a dream matchup against an Atlanta defense ranking bottom-five in fantasy points per game and fantasy points per dropback allowed to opposing quarterbacks. He’s not just a QB1 this week, but a high-end QB1. Among all running backs, Yeldon ranks sixth in expected fantasy points and eighth in actual fantasy points. This is despite Leonard Fournette playing in two of these games (four quarters total) and Corey Grant routinely mixing in the rest of the time. Now, with both out for Week 7, Yeldon is locked into a bell-cow workload against a Dallas defense without Sean Lee. He’s a mid-range RB1 this week. White currently ranks seventh among all running backs in fantasy points, and 21st among all receivers in targets. He’s led his team in targets in four of their five games. Now, he gets set to face a Kansas City defense that has given up the most receiving fantasy points per game to opposing running backs. He’s a mid-range RB1 in PPR leagues this week. 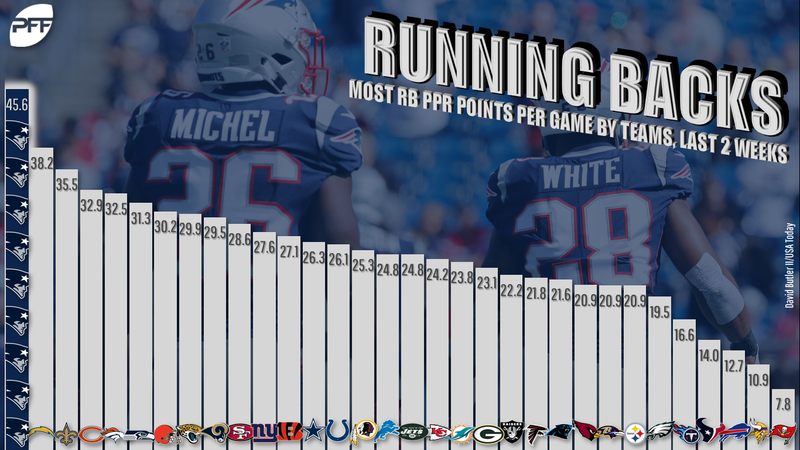 Although I like White, there’s room for both running backs to provide RB1 value with Rex Burkhead is out of the picture. Michel and White played on all of the team’s running back snaps last week. Over the past two weeks, Michel totals 43 carries, one target, 222 yards, and two touchdowns. Although Kansas City isn’t as bad to running backs on the ground as they are through the air, they’re still not good in that department either. Kansas City ranks third-worst in yards per carry allowed and eighth-worst in rushing fantasy points per game allowed to opposing running backs. There’s always a risk Michel gets hurt by gamescript (if Kansas City takes a lead), though Vegas doesn’t see it that way, with New England favored by 3.5. He’s a borderline RB1 for me in PPR leagues this week. Woods already leads the Rams’ wide receivers in expected fantasy points per game and ranks 17th overall. In terms of actual production, he ranks 12th in fantasy points per game. Now, with Cooper Kupp and Brandin Cooks in the concussion protocol, Woods could be in line for an even larger workload. Even if not, the matchup is juicy enough to keep him in high-end WR2 consideration. Woods projects to run over half of his routes against Bradley Roby, who has surrendered the sixth-most fantasy points of any cornerback this year. Rivers ranks eighth among quarterbacks in fantasy points but I’m bumping him down to the mid-QB2 range this week. I’m actually a little intimidated by Rivers’ matchup against the Browns. Yes, those Browns. Cleveland ranks second-best in opposing passer rating, second-best in fantasy points allowed per dropback, and second-best in schedule-adjusted fantasy points per game to opposing quarterbacks. Lockett has produced like a fantasy WR2, ranking 23rd in fantasy points per game, but he hasn’t seen the volume to support that sort of designation. He ranks just 57th in expected fantasy points per game and 57th in targets per game. With Baldwin back and practicing in full, I have Lockett ranked as only a borderline WR3 this week, despite the soft matchup against the Raiders. McCoy finally had a game with good volume, totaling 24 carries and three targets in Week 5. That’s promising, but it’s still not enough to start him in shallow leagues. He averaged just 9.7 touches per game and 42.0 yards from scrimmage per game the rest of the time. Buffalo won last week, which paved the way for the high carry total, but that seems unlikely this week as 8.0-point underdogs to the Texans. McCoy is just a fringe RB2 this week. Funchess currently ranks 47th among wide receivers in fantasy points per game, while being out-targeted by Christian McCaffrey 32 to 28. With Greg Olsen returning this week, Funchess is likely now only the team’s No. 3 option in the passing game. Over the past two seasons Funchess averages only 9.3 fantasy points per game and 5.8 targets per game when Olsen is active, but 14.0 fantasy points per game and 7.5 targets per game the rest of the time. Not only has Boyd out-targeted A.J. Green 38 to 35 since Week 2, but he ranks 11th among all wide receivers in targets over this span. With Tyler Eifert out and Green drawing shadow coverage from Joe Haden (who held Julio Jones to just 62 yards last week), Boyd is set up again to see good volume. Pittsburgh ranks fourth-worst in fantasy points per game to opposing slot wide receivers, which is where Boyd runs 67% of his routes. Gamescript got out of hand for Oakland last week, and Lynch saw only nine carries and two targets. Across the three previous games, he averaged 19.0 carries and 3.0 targets per game. Game-script should be much better this week, at home against Seattle, as only 3.0-point underdogs. Seattle has also been far more beatable on the ground this year – 36% of Seattle’s total yardage surrendered has come on the ground, which ranks fourth-most. Sanu is coming off two big games in back-to-back weeks. Over this span, he totals 10 receptions, 184 yards, and a touchdown (on 16 targets). I’m predicting another big game this week against a Tampa Bay defense that’s been getting destroyed by slot wide receivers since losing starting slot cornerback Vernon Hargreaves to IR. Sanu runs 75% of his routes from the slot, and Tampa Bay is giving up a league-high 30.4 fantasy points per game to opposing slot wide receivers, which is more than double the league average rate of 14.5. Over the past two weeks, with T.Y. Hilton and Jack Doyle out of the lineup, Rogers has averaged 18.0 expected fantasy points per game. That ranks 10th-most among all wide receivers over this span. He’s run 94% of his routes from the slot and draws the only defense anywhere near as bad at covering slot wide receivers as Tampa Bay. The Jets are giving up the second-most fantasy points per game to opposing slot wide receivers, but the eighth-fewest to outside wide receivers. Furthermore, I expect these splits to be even more dramatic this week, with Trumaine Johnson coming back from a quad injury and Buster Skrine (their starting slot cornerback) in the concussion protocol. Ekeler is really good. He’s our single highest-graded running back. Among all running backs, he ranks third in yards per carry and first in fantasy points per target. However, that’s also why he’s a fade in shallow leagues – he’s unsustainably efficient and due for regression. Even with his numbers bolstered by two blowouts, he’s averaging just 6.8 carries per game and 3.4 targets per game. Last week, Morris saw 10 carries and two targets following Matt Breida’s first quarter exit (due to injury), while Kyle Juszczyk and Raheem Mostert combined for six carries and six targets. So it appears, even with Breida out this week, Morris will be stuck in a low-upside committee. On the road as 9.5-point underdogs against the Green Bay Packers, he’s no better than a fantasy RB3 this week. Miller has struggled this season, just as he has throughout his entire Houston tenure. Alfred Blue totaled 119 yards from scrimmage last week in Miller’s absence, which is a number Miller has only eclipsed once over his last 21 games. Blue turned this backfield into a committee toward the final three weeks of last season, when he out-snapped Miller 98 to 64. I see no reason why Houston wouldn’t go that route this week after Blue’s success and with Miller still dealing with an injury. He’s just a low-end RB3 this week. Although the matchup is soft for Tampa Bay’s running backs, it’s hard to trust any of them. In their last game, only Peyton Barber and Ronald Jones saw touches — Barber had 8 and Jones had 11. Despite handling 52 touches this regular season, Barber totals only 16.1 fantasy points. Jones, including preseason, totaled just 51 yards on 38 carries (1.3 yards per carry) while dropping three of his five targets. Neither ranks better than a high-end RB4 for fantasy this week. With Jay Ajayi and Darren Sproles out for Week 6, we can expect similar usage to what we saw from them in Week 3 under identical circumstances and with a mostly neutral game-script. Clement totaled 16 carries, four targets, and one opportunity inside the 10-yard line. Smallwood totaled 10 carries, four targets, and two opportunities inside the 10-yard line. Basically, this looks like your typical 50/50 committee backfield. In a neutral matchup against the Giants with similar projected gamescript, I have both as mid-range RB3s this week. Cohen was MIA throughout Chicago’s first three games but exploded in Week 4 before their bye. He totaled 13 carries, eight targets, 174 yards, and a score. This was despite a gamescript that was much better suited for Jordan Howard, who saw only 11 carries and one target. The matchup is strong for both running backs this week. Miami is giving up the fourth-most total, seventh-most rushing, and fourth-most receiving fantasy points per game to enemy running backs. Cohen is risky in that his Week 4 usage may have been an outlier, but I’m still starting him as a high-end RB3 (in PPR leagues) this week. In Week 5, Hooper set a new career high in targets with 12, catching nine for 77 yards. This was well out of line from his typical usage – he’s seen six or fewer targets in 91% of his career games. Although I’m pretty sure that last week’s usage was just an outlier, Hooper is still worth a start this week. Atlanta has the second-highest implied total of the week (30.5) and Tampa Bay ranks third-worst in schedule adjusted fantasy points per game to opposing tight ends. Dalvin Cook has played on only 18 snaps over Minnesota’s last three games and Murray hasn’t impressed in his absence. He’s seen just 15 total carries and 11 total targets over this span, averaging only 7.2 fantasy points per game. In his defense, game-script was never ideal across the first two games, trailing on 80% of their plays. Then, last week, he faced off against the league’s toughest run defense in the Philadelphia Eagles. The matchup and projected game-script should be much better this week. Minnesota is favored by 10.5-points and Arizona is giving up the most rushing fantasy points per game to opposing running backs. He’s a mid-range RB3 this week. Although production has been thin for Sutton, volume has been strong. He ranks 36th among all wide receivers in expected fantasy points and eighth in expected touchdowns (2.98, more than Emmanuel Sanders and Demaryius Thomas combined). If he were to post a breakout game, this would be the week to do it. He’s run 53% of his routes from Case Keenum’s left, which is where Marcus Peters has lined up on 89% of his routes with Aqib Talib out. Peters suffered a hamstring injury in Week 3 and is clearly playing at less than 100 percent. Over this span Peters has surrendered a whopping 14 receptions, 255 yards, and five touchdowns on only 17 targets. Fitzgerald is hurt and playing through an injury, and it’s obvious. He hasn’t hit 6.0 fantasy points since Week 1. He should ride the bench until he proves he’s healthy. It’s clear Denver prefers Phillip Lindsay as the team’s RB1. Over the past two weeks, he totals 24 carries and six targets to Freeman’s 13 and four. On a below-average offense, that sort of workload isn’t going to cut it, even in a good matchup like the one Freeman has this week. After a hot start to the season for Williams, the regression we were waiting for hit hard the past two weeks, as did a decline in volume. Over this span he totals just seven targets and 60 yards. He’s an easy fade. If Henry couldn’t reach even 6.0 fantasy points against the Bills last week, I’m not sure you can start him at any point this season without an injury to Dion Lewis. At the very least, you’re not going to be starting him this week against Baltimore. The Ravens have given up the fifth-fewest rushing fantasy points per game to opposing running backs.